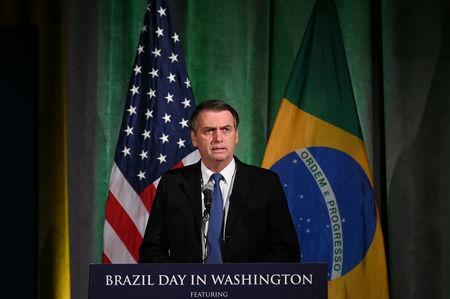 WASHINGTON (Reuters) - Brazilian President Jair Bolsonaro visited the CIA on Monday as he sought support from the Trump administration for his security agenda and courted the U.S. business community on his first official trip to Washington. 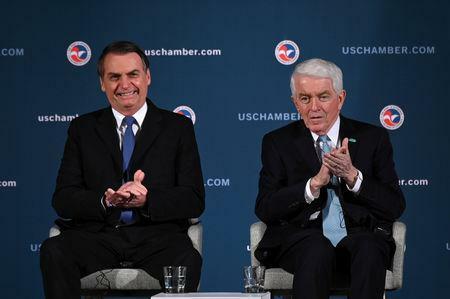 The three-day visit underscored Bolsonaro's embrace of U.S. influence in Latin America to confront what he calls a communist threat against democracy — a theme he remarked on at a dinner on Sunday evening with his ministers and right-wing thinkers. 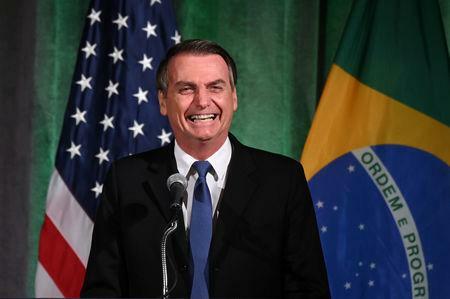 In a late edition of Brazil's official government gazette, Bolsonaro issued a decree waiving a visa requirement for visitors from the United States, Canada, Australia and Japan. Presidential advisers, including his official spokesman, had said during the Sunday dinner that Bolsonaro's agenda on Monday morning would be kept private. But the president's son, Congressman Eduardo Bolsonaro, revealed the CIA visit in a Twitter post.